Here's a simple way to find when you've created your Gmail account. You can always find the oldest message from your account by visiting this page https://mail.google.com/mail/#all/p1000000: you'll get an error message and Gmail will redirect to a page that shows the oldest messages from your account. The problem is that this is not a reliable way to determine when the account was created: maybe you've deleted some messages, maybe you've imported messages from other accounts. If you've joined Google+, you can quickly find the exact date. 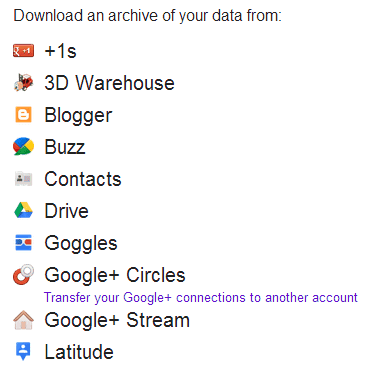 Go to Google Takeout, click "Transfer your Google+ connections to another account" (don't worry, you don't have to do that), enter your password and you can see the date when you've created your Gmail account in the blue box at the bottom of the page. Why would you need this information? For example, Google's account recovery form includes a question about this. "If you find yourself locked out of your account and none of your other recovery options work, your last option is to visit our password-assistance page and fill out our Account Recovery form. (...) Since Google doesn't collect a lot of information about you when you sign up for an account, we'll ask you questions like when you created your account, what Google services you use, and who you email frequently (if you use Gmail)." I haven't tested this, but I assume this trick also works for non-Gmail Google accounts. Same here. This information is no longer relevant. did any of you find how to find it? Outdated. Not in working condition. Everything has been changed. Any idea friends !! Was Sold An Stolen IPhone Have My Police Report The Phone Was Set Up With An Email Hunnie@Gmail.Com I'm trying to find the owner...I Have No Luck! Here's the way to find your Google creation date, originally posted by Khairuzzaman Mridha Shakir. Go to the "Gmail settings" and then "Forwarding and POP/IMAP". Here find the line saying "POP is enabled for all mail that has arrived since 22/4/09 " Here this date is for my Gmail. You will see the date when you have created your Gmail account. Looking at the POP/IMAP settings is great for those that enabled POP but I didn't and I know my account goes back to 2004 at least by checking the oldest "Sent Items" email. Would be cool to know when exactly I created the account. Guys this is work around,by this way I can only get the date when I got the first mail or sent first mail. but requirement is to know the gmail registration date that is when I have sign up with gmail. can anyone help me to find the creation date of my gmail account?. the first confirmation mail has been deleted. if you got the way , please tell me ? So how are we supposed to find out the creation date of Accounts we created years ago if Google isn't allowing the legitimate USERS of the accounts access to this information?? Subscribe, yeah indeed, this is ridiculous! How can i change my gmail account created date....I need this help please. hi if you found the account created date please let me know also.